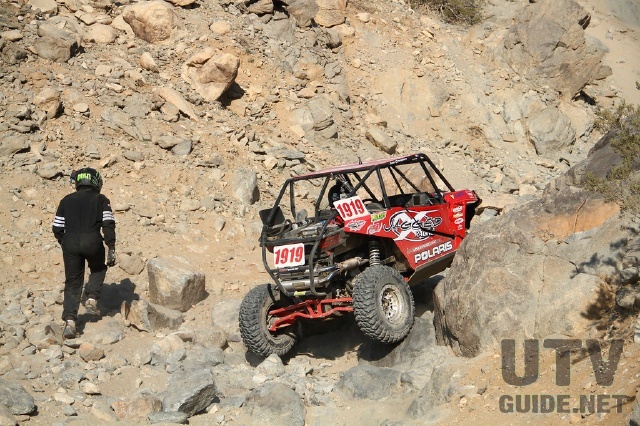 This years King of the Hammers UTV race was my sixth. Many would call that some sort of sickness, I think it is more of an addiction. 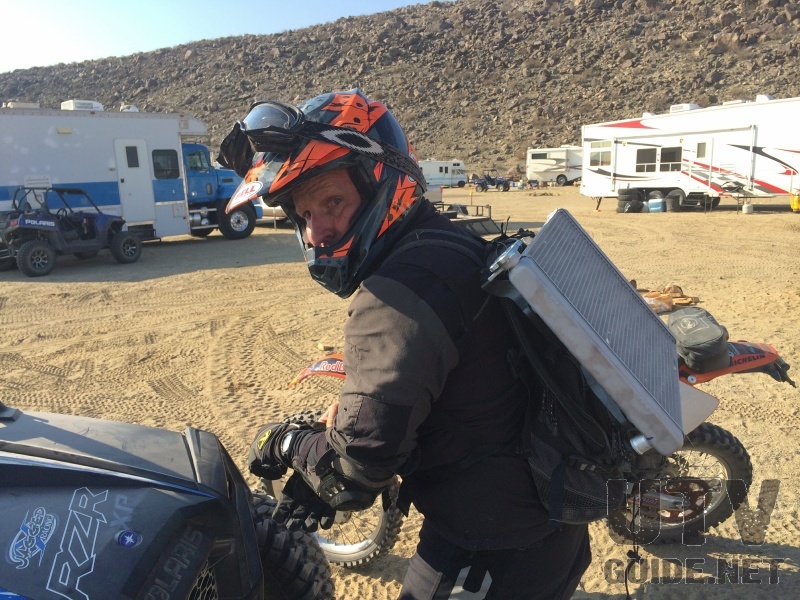 King of the Hammers has always been a test of man and machine, but last year, Dave Cole, owner of King of the Hammers & Ultra4 Racing, pushed the difficulty level to such an extreme that only three UTVs finished (less than 10%). 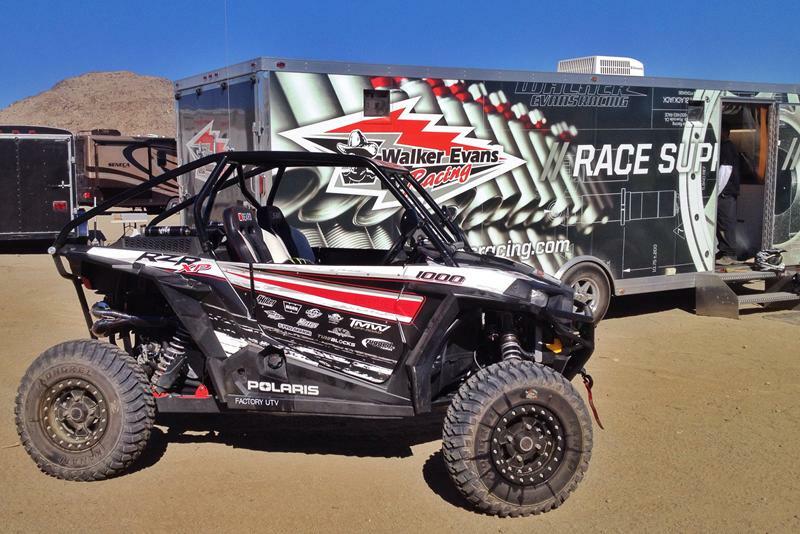 For the 2013 race, I built up a Polaris RZR XP 900. It had been tested and was ready to race, but I had yet to decide on a co-driver. About six weeks before the 2013 race, I teamed up with Jagged X for pit support and enlisted Blake Van de Loo as my co-driver. The race was super tough, but Blake and I worked through all the challenges and worked together like a team that had racing together for years. 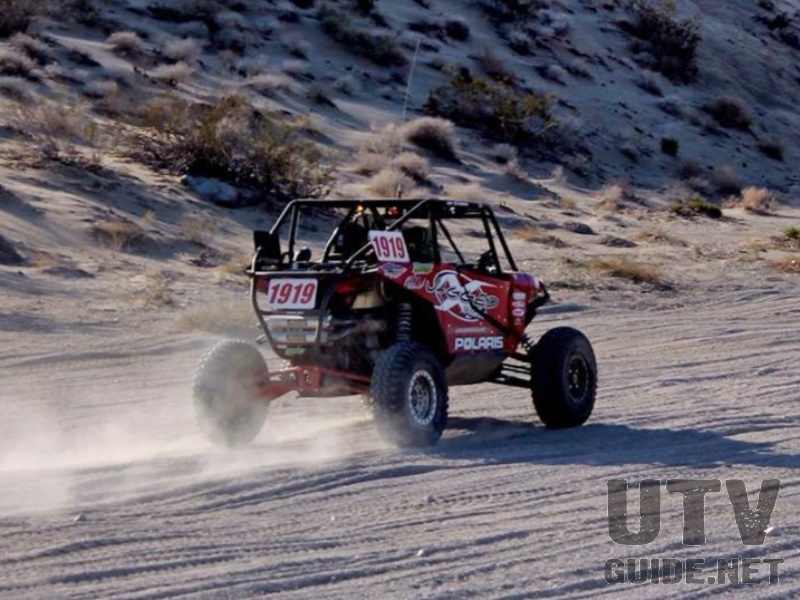 The combination of vehicle, co-dog and pit support turned out to be the ticket and we finished in 2nd place, just 16 seconds behind Mitch Guthrie (2013 UTV Race Recap). After the race, I met up with Blake at Rally on the Rocks and we talked about switching seats for 2014. 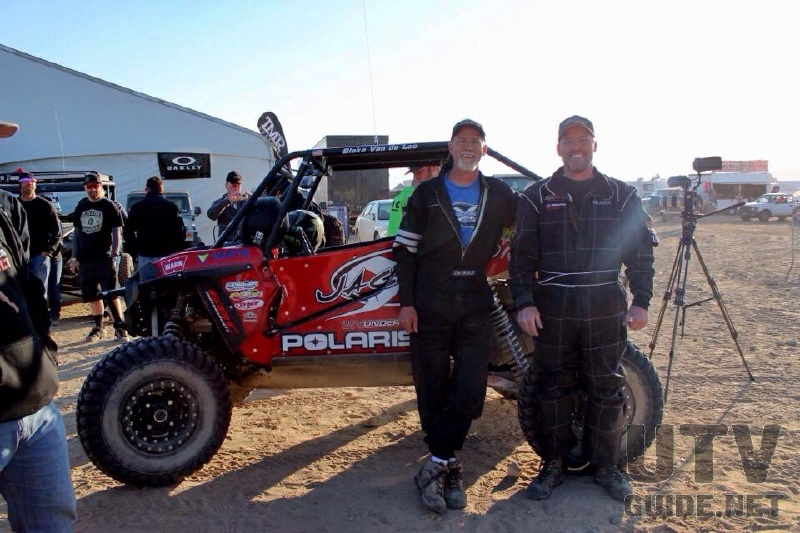 I figured it would be reason enough to push me into getting in shape, and Blake was eager to build a new car and try his hand at the left seat.The new Polaris RZR XP 1000 came out in August, and we figured it would be superior in the rough desert sections. I quickly got my hands on one and headed to the Rubicon Trail to see how it would fair in the rocks (see RZR XP 1000 Rock Crawling Review). After a day trip in the rocks, I was sold and Blake and I decided the XP 1000 would be the platform. My plan was to build a car parallel to Blake so we could have it for pre-running and also as a backup.For my car, I went with bolt-on accessories while Blake completely stripped his XP 1000 down to the frame and started chopping. He added a fuel cell to the bed which allowed him to remove the stock tank and raise the underside for better ground clearance (aka boat side). He then lowered the seats, added a custom cage, Warn winch, hydraulic sway bar disconnect, Factory UTV UHMW, LoneStar Racing a-arms, High Lifter radius links, Muzzys dual exhaust and custom trailing arms. To increase the cool factor even more, Blake added an unlocking rear differential (turf mode) out of a Ranger XP 900 and topped it off with turning brakes for the rear wheels. 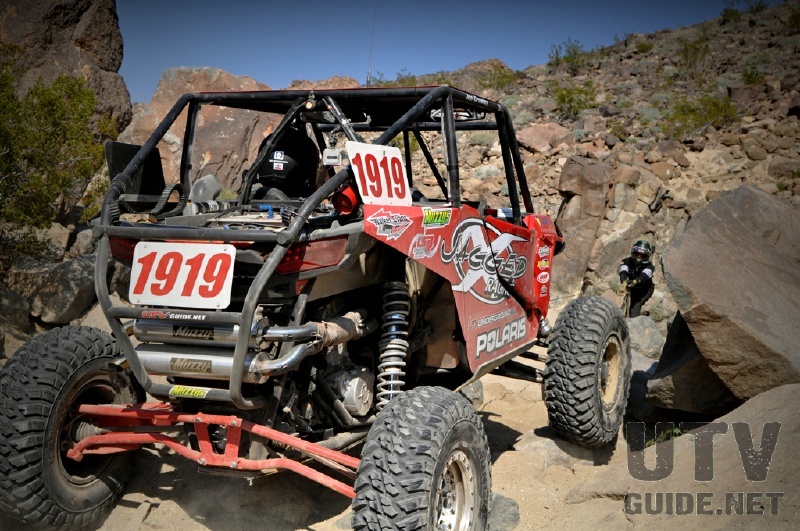 The build came down to the wire, and we arrived in Johnson Valley on Friday before the race. Blake showed up a little frazzled with a few items left on the punch list and about 5 miles on the odometer. 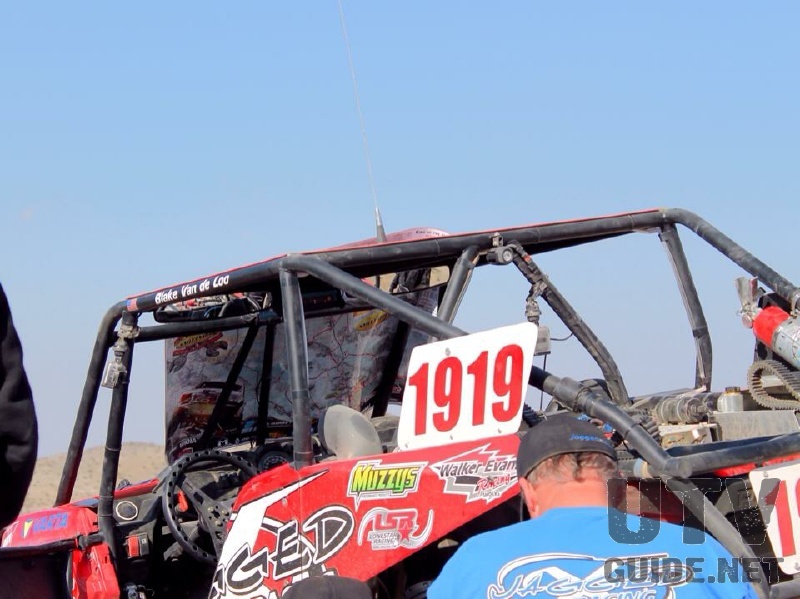 We knew the long and rough desert sections would take their toll on the car so dialing in our shocks was the first agenda item. The guys from Walker Evans Racing showed up Saturday morning, and went right to work. We bolted up a new set of 2.5 shocks up front, and they re-worked the rears with new valving, springs and cross overs. After a few tweaks for ride height and compression adjusters, the XP 1000 was blasting through Johnson Valleys like no car I have ever been in. 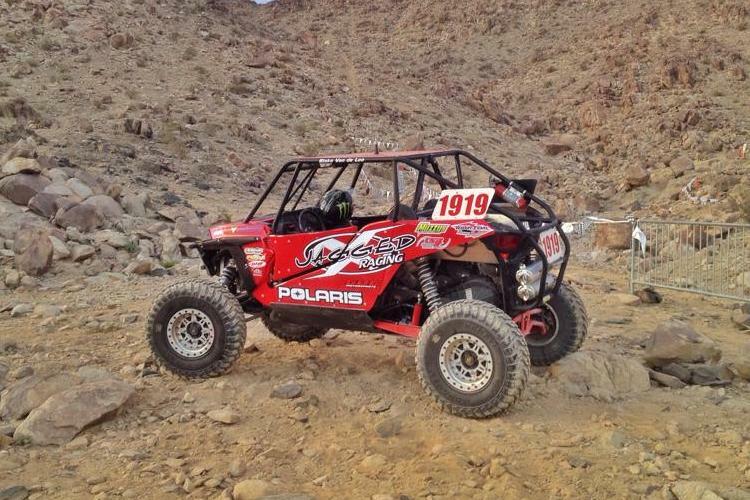 After more testing in the desert and a few rock trails, the car was race ready, except for sponsor graphics. Jagged Xs Bill Schueler spent the better part of an afternoon installing graphics, while I pre-ran some of the course in my RZR. 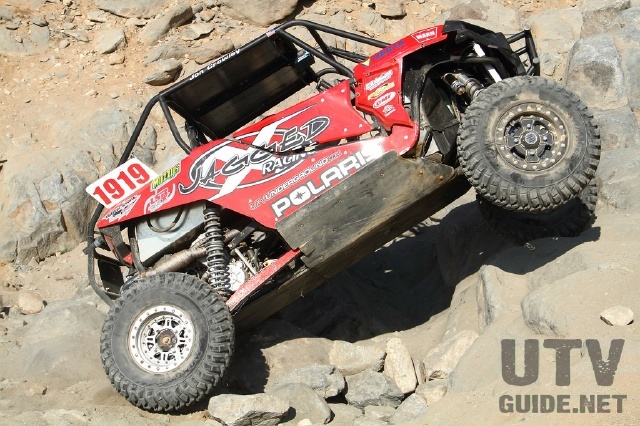 We took the car out to Turkey Claw for a last rock crawling test and it was ready for qualifying on Tuesday morning. Blake and I pre-ran the qualifying course twice on Monday and after determining that we wouldnt need to winch, decided that Blake would do better without the extra 200 lbs. in the right seat. Blake was doing great until the rock obstacle at the Red Bull arch. A large rock had been moved near the downhill side and forced Blake to take a super sketchy line off a rock laden cliff. Blake blasted downhill and into a large rock with both passenger side tires and almost went over. Blake qualified 10th, but the impact was so hard that even with 15 psi and Tire Blocks, the force bent the front wheel and punctured two tires. We were lucky that an arm wasnt torn off the car. The rest of the day was spent prepping the car, and one of the decisions made was to switch to my set of wheels and tires. I was running 30x10R14 GBC Mongrels and Tire Blocks as well, but I had HiPer beadlock wheels with Fullerton Sand Sports billet race centers. It was an easy swap and running without plugs from the start was the safe decision. Race day came and we all lined up at 7:30. Right away, our GPS started to lose position. We reset the unit a few times without change, and then figured it would probably be better once we started moving. UTVs left the line two at a time and we were on the fifth line two minutes after the first row. Blake got the holeshot and set a smooth pace. Within a few miles, the GPS lost position. Powered it off and back on constantly while passing UTVs one after another. The Walker Evans shocks were working incredibly well and soon we were on Mitch Guthries heels. We got past Mitch and then saw Branden Sims ahead. We closed in on Sims in the dust then found another line next to him. His spare tire was flopping around in the bed like a rag doll, but Sims did not slow down. We diced it up with Sims for a bit and then got in front with clean air in front of us. Blake was driving hard and putting some distance between Sims and Guthrie, but now we didnt have any dust to follow. Our GPS was still coming in and out every few minutes and we ended up off course by about a mile. Crap! Back to the course and behind Guthrie and Sims again. We got back in front of them in fairly quick order and had pit 1 in site. We had been calling our chase crew for a while with no response until we were about a mile away. We rolled through the pit without stopping and returned to race speed heading for mile marker 39. There were three or four trails to choose from, with non-existent course markings so we followed our GPS which appeared to be working. Less than sixty seconds later, the GPS refreshed and showed us off course. We saw Sims on course to our right and Blake headed through the desert to get back on course. Blake was trying to get over before Guthrie could pass us again and we ended up hitting a bush right on the bumper. We got back on course and started chasing down Sims when the RZR started stuttering. We got out and checked the car over only to find the radiator leaking. Really?! We were about two miles from pit 1 and our Jagged X chase crew got permission for us to return to the pit after everyone had passed us. 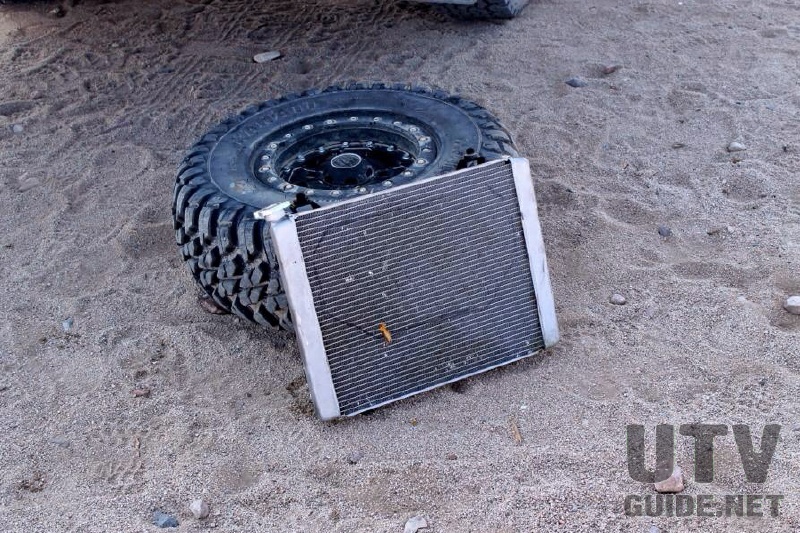 It took two or three sessions of dumping water in the radiator and driving a ways before overheating. We let it cool, then added water and moved further along. It took over half an hour but we got back to pit one and the Jagged X crew went into action. I figured we had a lot of time because the radiator had to come all the way from Hammertown and that would take some time in a chase truck. But a few minutes later, Eric Anderson from VARTA Batteries blasted into the pit on his KTM motorcycle. Strapped to Erics backpack was a brand new radiator. Hard to beat that kind of service! After the radiator was installed and cooling system bled, we were back in the race well behind the last car with the goal to finish the race. On the way to main pit, the GPS went out a few more times, and we passed several cars in the Sportsman class. At the main pit, we topped off on fuel and tried a different GPS antenna to see if we could get the GPS working. Unfortunately it did not so we headed out of the pits. We picked off a few more cars on the way to Aftershock which is the first real rock obstacle on the course. We were making good time when we approached a short waterfall. 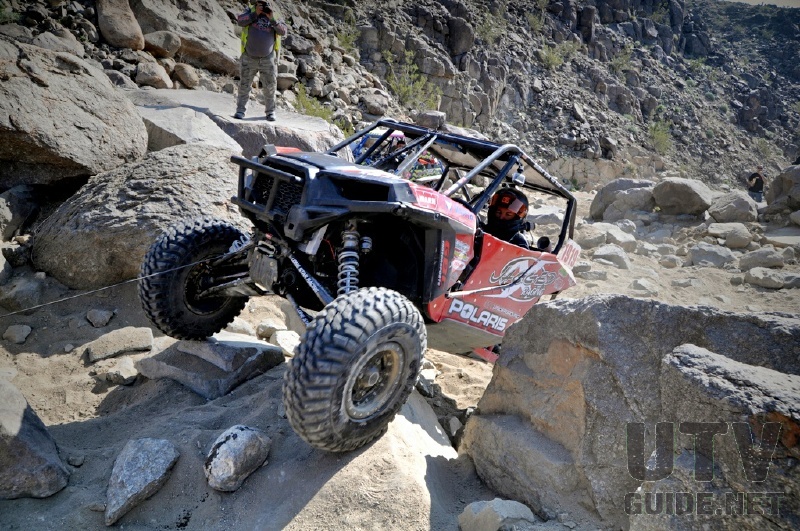 I stayed in the car and the RZR climbed with ease, but neither of us saw the big rock that somehow reached between the drivers a-arms, hit the axle and took out the outer CV. I jumped out of the car, and quickly jumped back in with axle in hand. This was déjà vu for us since we broke the same axle last year heading up Hwy 19/20. While we had more rock crawling to do than last year to get to pit 2, Blake and I knew what was in store for us. We passed a few broken cars then ran up against a few Sportsman UTVs. They didnt look like they were in too much of a hurry and we made passes where we could but still lost a good 15-20 minutes getting past them. Other than the traffic and a few winch spots the trail went pretty smooth for us. Past the top of Aftershock, we stopped for a moment to make a decision. I could hike ¾ of a mile over the hill to pit 2 and get a new axle so we could do a field repair, or we could head back down and attempt Hwy 19/20 in three-wheel drive like we did last year. It was a quick decision to keep moving and take on 19/20 in three-wheel drive. In my opinion, Hwy 19/20 is the longest and hardest trail on our course. I would guess that you climb well over 1000 feet in two miles with several obstacles that are tough in four-drive, let alone three-wheel drive. We took our time and attacked most obstacles with me out of the car. We winched often and I was getting a serious workout making my way up hill hauling the winch line and tow strap. We reached the last tough obstacle and I was getting setup to winch. 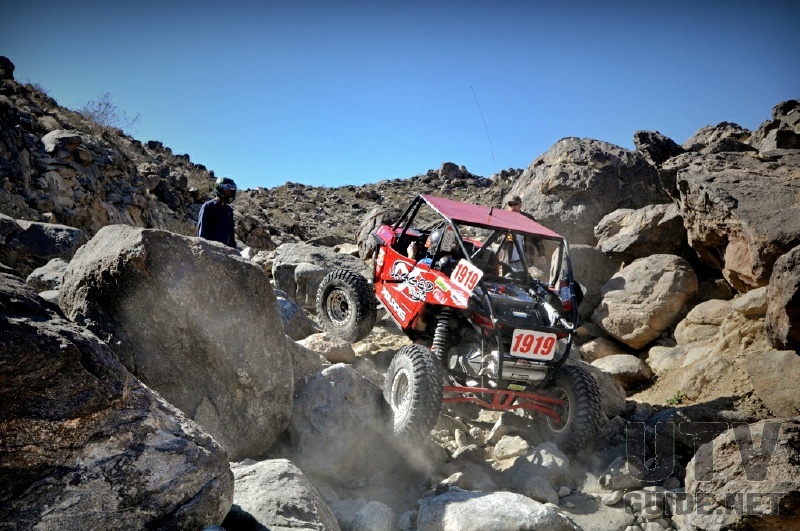 The strange thing when you have to winch a lot in Johnson Valley is there are rocks everywhere, but when you need to winch, there is rarely a suitable rock that is close by. I pulled cable uphill for a long pull when all of a sudden the winch line came out. With the top in sight, it was a kick to the nuts for me. Blake put the RZR in park and we worked on threading the winch line back in with a hot radiator and tight working quarters. After that, it was smooth sailing until the pit. We had been out of contact with our chase crew since leaving the main pit and as we crested the top of the trail our radio finally worked and we sprung the news of the broken axle. We reached the pit and once again the Jagged X crew went to work. Blake and I hopped out to eat and rehydrate while the team made quick work of the axle and refueled the RZR. It was just before 2PM and we had a little over two hours to complete the rest of the course in time. With 40 miles and several tough rock trail left, it would be a tall order, but we were determined to give it our all. Our new “GPS”. Gotta love pit crews with a sense of humor. We made quick work of Fissure Mountain, and ran into traffic descending Jack Hammer. I jumped out and asked if we could pass and they waved us along. Blake wasnt so sure of the line, but I was just happy to have the opportunity to get past them. Blake was right and he ended up tipping onto their hood, which kept him from rolling over. My bad. Dont think we caused any damage, but I felt bad to make a pass like a serious rookie.We bounced down the rest of the super rocky trail before jumping into the sand for a few miles. At the bottom of Chocolate Thunder, a large crowd had gathered to watch the action. I jumped out and Blake made quick work of the lower section. I was up high and trying to guide him up and over a nice ledge but we were struggling. It was that point where I realized that I am much better at reading lines from in the car than I am outside. Blake made it up without winching, but it wasnt the smoothest accent. Just a mile later we hit the bottom of Wrecking Ball and there was another RZR on the trail. Blake and I knew that any slow down would ruin our chances of a finish so we pushed hard. I was out of the car and looking for alternate lines and the other RZR was making progress just a bit slower than we would. This went on for a while without us getting by. I was still out of the car and the other co-dog was in his car. Blake wanted me back in, but I didnt figured I might be able to find a different line with me out. Shortly afterward, Blake got by and I kept running until there was a single lane where I could get in without them passing us. We winched once at the waterfall, but otherwise made great time and put some distance on the other RZR. We made great time on Clawhammer, Lower and Upper Big Johnson and Boulderdash before hitting pit 2A. We didnt need anything, but thought it was a good idea to have the crew check the tires to ensure we did not have a flat. We flew in and out of the pits and were told that we didnt have much time left and we need to hurry. What do you think weve been doing since we last saw you! LOL. Back out into the desert the Walker Evans shocks let us fly through the rough terrain. We blasted up Martel and up Elvis without winching, then out across the desert again at high speed. The last obstacle would be the sand hill at mile 116.5. Blake took it easy, but then slammed into two large rocks that had moved onto the course. It almost sounded like we broke an axle and we knew there was no time for that. Blake backed up and headed left and jammed right up the rest of the hill. The rest of the 120 mile course was a breeze and we got to the finish line with just a few minutes to spare. It was quite a feat after the tough hand we were dealt, but often the race at King of the Hammers isnt about making it on the podium. It is about handling everything the desert can throw at you with determination to get to the finish line. We never gave up, and neither did our support crew. Blake built an awesome car that can easily win this race and I am proud of the job we did on race day. Being in the right seat is a completely different experience, and I tried my hardest to not let the team down.In the end, the incredible finish could not have been completed without such an awesome vehicle, plus the stellar support from the crew at Jagged X, and a little extra help from Eric at VARTA and Scott at High Lifter. 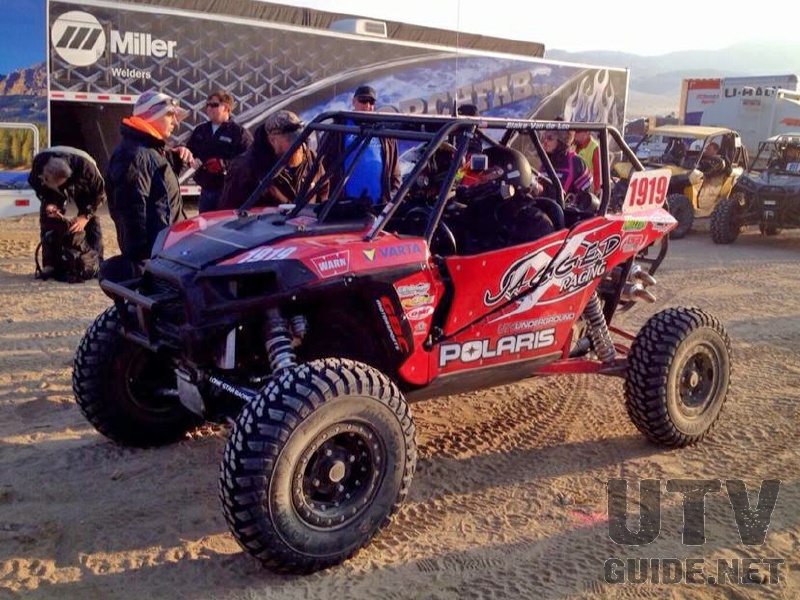 This could be the last year for UTVs to race at King of the Hammers. 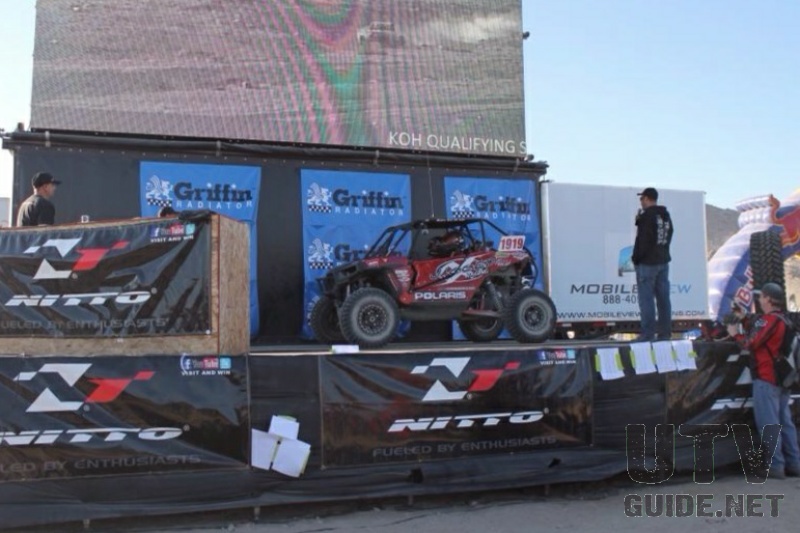 Dave Cole said that in order for there to be a UTV race in 2015, we need UTV race sponsors and more UTVs to race. I think it is achievable with some early guidance and early notice to potential racers.